Are you looking to go kayaking with your family or friends? Or go fishing out in the lake or river? Then the tandem kayaks are a stellar option to amp up your outdoor adventure experience. A high-quality tandem kayak is a true workhorse, and can provide a variety of functions to work properly on multiple aquatic terrains. While many tandem kayaks function similarly, there are little details to be considered before making a final decision on choosing a new kayak. There are plenty of things that we have learned through years of kayaking and whitewater rafting expeditions. This guide is a culmination of that, resulting in testing and selection of the best tandem kayaks . 4. What Should My Tandem Kayak Be Made of? 5. 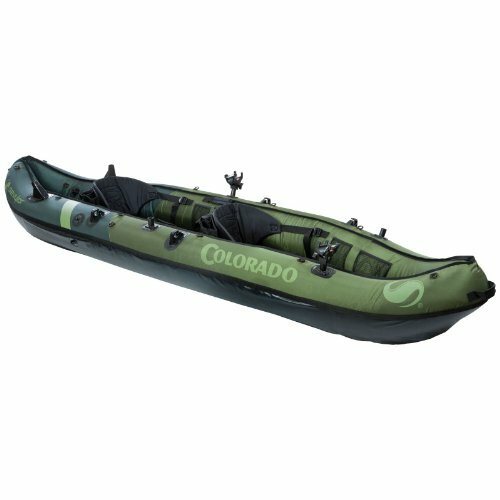 What Tandem Kayak Size Should I Buy? 6. What Type of Maintenance is Required? 7. What Accessories are Available for My Boat? The Malibu Two by Ocean Kayak is on the smaller side as far as tandem kayaks go. For those without sports utility vehicles, or those who plan to paddle through confined spaces, this option is wonderful. It’s a fact: smaller boats are far easier to maneuver both on dry land and in the water. 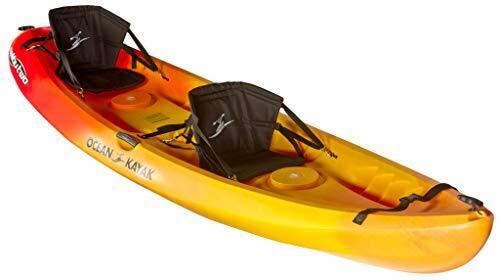 However, the strongest feature in my mind about the Ocean Kayak that truly makes it the best 2-person kayak is the wrap-around seatbacks. While other two-person kayaks have separated backings that can become flimsy or break, the Malibu’s contours to the share of your back, and is taller than most seatbacks as well, providing ample support. The comfort makes this option ideal for longer paddling trips. It should be noted that the Malibu is shorter than other tandem kayaks tested. If you or your paddling partner are taller than average, space might be cramped. However, with a sit-on-top design, the kayak is comfortable and forgiving to any and all paddlers. Additionally, a third center seat allows for a child to ride along. However, there is no backrest or padding on the center seat. The Sevylor Coleman Colorado is the most versatile inflatable tandem kayak for fishing, and is one of the best value tandem kayaks we tested. The kayak is made of thick-gauge PVC. It has multiple air chambers to ensure that any rare ruptures don’t cause the complete sinking of the ship. The adjustable Coleman seats will keep you and your kayaking partner paddling comfortably during the entire trip. However, if you want to move quickly, you can always add the branded trolling motor and store your paddles in the convenient holders. The Berkley Quick Set fishing rod holders let you adjust your fishing pole angle. This provides the ultimate hands-free fishing experience. With your hands free, it’s easier to take care of your gear, which stores nicely in the mesh pockets or attached to D-rings. 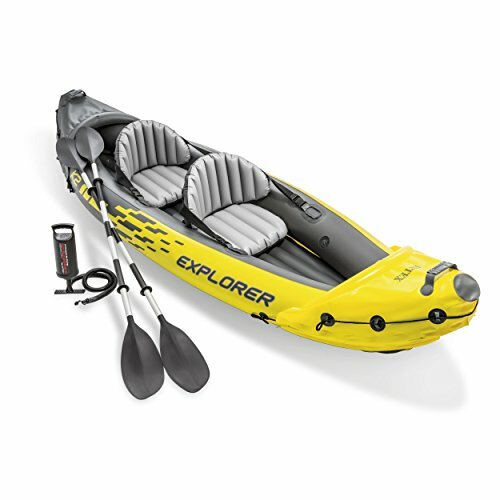 The Intex Explorer K2 is an ideal option for solo kayakers. Being inflatable, it offers incredible value, while at the same time being feature rich and perfect for all instances. One of the most obvious advantages of the Intex inflatable option for solo travelers is that the boats are incredibly easy to transport. This kayak deflates to such a compact size that it can be transported in the trunk of a standard sedan or hatchback. 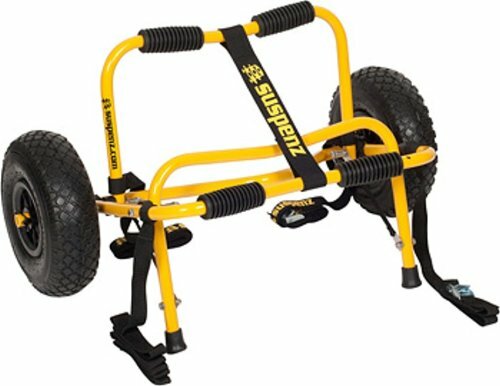 Weighing at just 31lb (14kg), you can carry it on your back or tow it without much trouble. However, this doesn’t mean that the Intex Explorer K2 Kayak is flimsy or difficult to maneuver. On the contrary, with its removable skeg and I-beam floor, this option has increased rigidity and remains highly maneuverable, virtually indiscernible from its hardshell counterparts. The maneuverability is a big deterrent for most lower quality inflatable kayaks, as these tend to zig-zag a good bit. The skeg keeps the kayak on course. Now, it should be noted that this Intex option won’t be as ideal as rigid alternatives. Yet, for the occasional kayaking enthusiast, or those without the space available, it will be perfect for getting in the water. Plus the price is incredible! 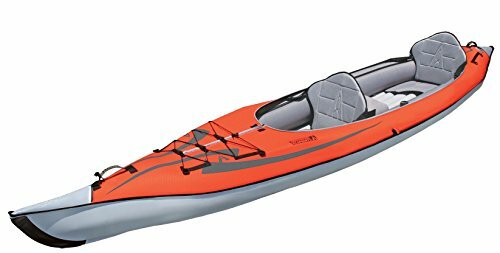 The Advanced Elements AdvancedFrame Convertible Inflatable Kayak is by far one of the most attractive and innovative kayaks we have ever tested. 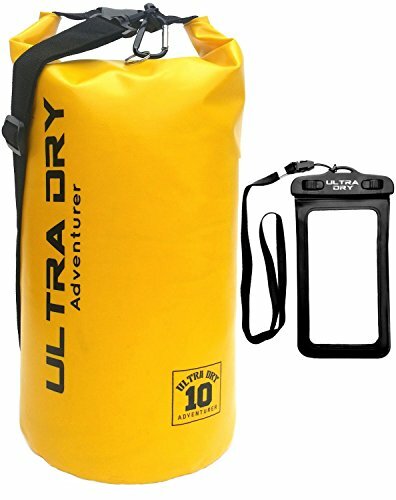 It is unique and truly solves many of the issues present in both inflatable kayaks and tandem kayaks. This boat is convertible in that it can be a solo or a tandem kayak. You can paddle solo using the middle seat, or tandem using the seats in the front or back. These can be changed up at any time, and the chosen setup has no negative effect on the quality and efficiency of the paddling. 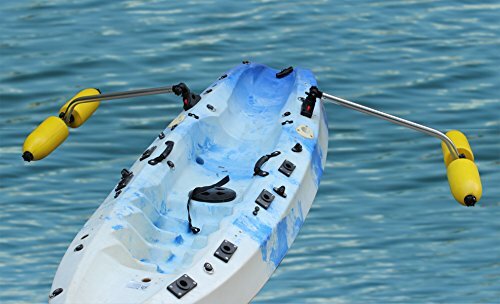 Additionally, while inflatable, this tandem kayak has an aluminum frame, providing strong rigidity lost on most other inflatable options (this comes at an increased price compared to alternatives). It will perform almost exactly like an equivalent rigid kayak. Unusual features such as deck rigging and a spray skirt round out this awesome option. The Vibe Yellowfin 130T is a feature-rich, long and wide tandem kayak. However, it has a price to match. Yet, this tandem kayak is the absolute best option for small families and/or dogs (two adults and a child, or one adult and two children). One of the main features to notice on the Vibe Yellowfin 130T is its footrests. While most kayaks have molded footrests at predetermined levels (think a ratchet), the Yellowfin changes things up. Their footrests are adjustable through a range, to adjust to the perfect fit for your leg length and comfort needs. This is a feature common on higher-end kayaks, now available in a solid kayak at an entry-level price. Additional features include two sealed hatches, molded drink holders, and two mounted fishing rod holders, as well as cord lashing for added fishing gear. This is a great option for small families, and is far more portable than a canoe alternative! With these reviews in place, you should be able to select the best tandem kayak for your needs. An ideal kayak will fit your budget, as well as any other requests you might have. This being the case though, there are some things that need to be considered before making a final purchasing decision. These include value, transportability, durability, gear storage, and stability and comfort. Do you have a constrained budget? If so, don’t start researching tandem kayaks that are well outside your price range. The range is vast. Some can be grabbed for under $400, others break through the $1,500 barrier. It’s always a smart idea to set a budget before making a decision on the kayak to purchase. Additionally, when considering value, inspect the features present in a tandem kayak. This will help you decide if it is worth the price point. Check if the kayak includes mounts, repair kits, and most importantly paddles. Having to purchase paddles separately can add $200 to your purchase cost easily. Also, check on the offered warranty. Many manufacturers of kayaks will only provide limited warranties that protect against manufacturer defects. As this is going to be a good-sized purchase, check for the longest possible warranty. This Sevylor Coleman Colorado kayak is great for fishing enthusiast! Regardless of where you look for these kayaks when comparing, the Explorer K2 is by far going to be the most affordable option, and the Vibe Kayaks Yellowfin 130T will be the most expensive option. The Sevylor Coleman Colorado sits in the middle, and is a fine balance of price and features. 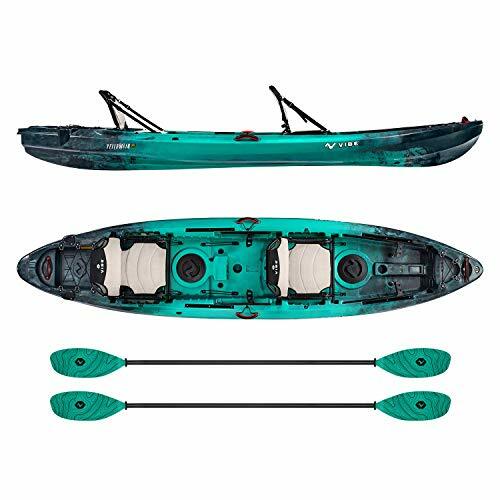 There is a point where pricing of inflatable kayaks and rigid kayaks meet, however in most cases the most well-built inflatable kayaks will be priced similar to mid-range rigid kayaks. To test warranties, we called each of the five companies. For inflatable tandem kayaks on our list, we requested further information on what would happen if a hole had ripped in the exterior, and the available patch kits (that came with all options) had been lost. All three companies (Sevylor, Intex and Advanced Elements) were all extremely receptive and laid out their warranty policies. For rigid tandem kayaks on our list, we requested further information on what would happen if a crack had formed in the outer shell of the kayak. Both Ocean Kayak and Vibe Kayaks were more than happy to oblige after some requests had been fulfilled to validate the presence of cracks. Standard kayaks will generally range between 75 and 100 pounds in total weight. While with tandem kayaks you will have at least one other person to assist, you need to keep in mind a solid action plan for transportation. While this may not be an issue with the inflatable kayaks on our list, some of the larger hardshell tandem kayaks would benefit from the use of a kayak cart. Lifting a small “boat” that weighs 90 pounds above your head and onto the roof rack of an SUV or station wagon is no simple task. A stronger option is something like a kayak trailer. 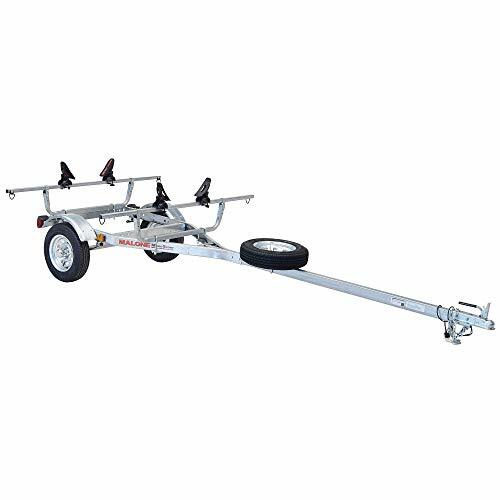 Any vehicle with a trailer hitch can tow a kayak on a trailer. Ensure to consider the weight that you can transport and carry unassisted. Regarding inflatable kayaks, obviously these issues will not be a problem. However, there are some inflatable tandem kayaks that do not come with any kind of duffel bag or storage medium. It’s crucial to ensure that your inflatable tandem kayak comes with a bag of some kind for storage and transport. The Ocean Kayak Malibu weighs 63 pounds, on the lighter end for rigid tandem kayaks. It is a minimal option without many frills, so the weight stays low. This makes it easily transportable in any vehicle that has a roof rack. 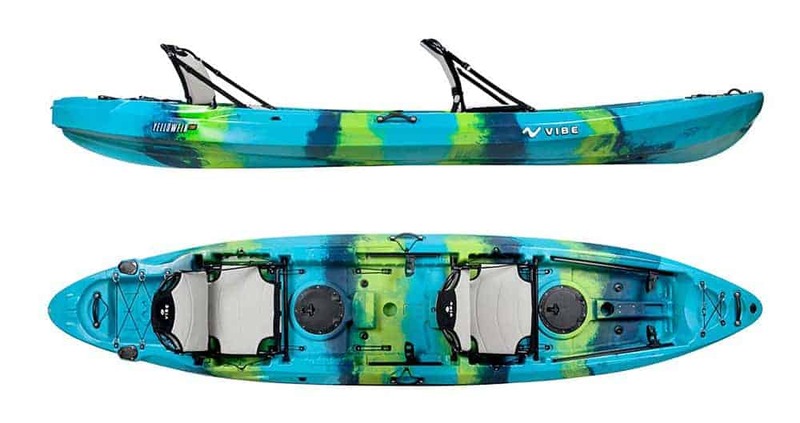 Comparably, the Vibe Kayaks Yellowfin 130T is longer and has a bunch of added features. For this reason, it weighs in at a bit over 80 pounds, so will be far more difficult for one person to lift onto the roof of a car. The Sevylor Coleman Colorado weighs a little over 40 pounds, and comes with a thin bag for transport. Comparably, the Intex Explorer K2 is a light 30ish pounds, and also comes with a gear bag for storage. This kayak is the lightest of the bunch so transportation is not a problem for solo kayakers. The Advanced Elements AdvancedFrame, with its aluminum frame, weighs about 55 pounds. Its gear bag is far thicker and easy to transport. Tandem kayaks should be durable. They should be able to serve their purpose for many years without issue. For this reason, it’s crucial to check on the materials that the boat are made of. Check things such as the handles, composition, paddle bars, and any other physical elements comprising the kayak. Remember, kayaks made of things such as heavy-duty plastic and PVC typically have the strongest durability. To test each of these tandem kayaks for durability, we went hard in the paint. Two of our strongest testers took them out on a shallow river full of rocks. The rigid kayaks ended up with some scratches, but were crack and dent free and came out the other side smiling. The Intex Explorer K2 had a small rip that needed repairing, but the other two inflatable kayaks came out the other end just fine save a few scuffs. Are you anticipating taking any electronics like a camera or smartphone kayaking with you? If so, dry and watertight compartments for storage provide some strong peace of mind. This allows you to communicate with the “outside world” when kayaking and to shoot pictures of your experiences. Additionally, watertight compartments eliminate the potential anxiety that can arise from the possibility of losing expensive electronics. And non-watertight compartments work fine for the storage of fishing gear. Enclosed kayaks have a hard time providing that level of storage. If the selected tandem kayak lacks the storage necessary for your devices, dry bags and waterproof phone pouches are another great option. Also, bungee cords are common to cross the top of a tandem kayak to hold jackets, shoes and non-electronics. For those kayakers who prefer minimalism, bungee cords are a great choice. The Ocean Kayak Malibu has no dedicated space for gear, and is meant to be a spartan, minimal, simple to transport tandem kayak. Conversely, the Vibe Kayaks Yellowfin 130T has two sealed hatches with bag inserts, large bungeed rear tank well and bow cargo bungee system. The Sevylor Coleman Colorado has mesh storage pockets that keep gear and snacks close at hand. It also able to mount a trolling motor. Alternatively, the Intex Explorer K2 offers minimal space for storage. The Advanced Elements AdvancedFrame has both underneath storage options, as well as “above deck” bungee cording for additional storage. Our options with ample storage were packed with over 50 pounds of backpacks and gear and taken across a lake. They were all stable and managed the advanced load extremely well. Kayaks may not always be incredibly comfortable on long paddles. However, there are some that are far better than others. When testing the comfort of tandem kayaks, we kept an eye on the leg room available, leg length accommodation, and materials of the seat. Speaking of the seat, some tandem kayaks come with removable middle seats. When used they can accommodate a child. When not in use, this is perfect for either a dog or more leg room. Are the seats sit in, or are they sit-on-top like an ocean kayak? What about stability in different conditions of water? Remember, kayaking down a river is quite different than a still, calm lake. Shorter tandem kayaks have a tendency to be far less stable and slower when compared to longer tandem kayaks. Inflatable kayaks also tend to lack the stability of rigid alternatives. Select a kayak that will meet your kayaking needs. We tested all five of the tandem kayaks on our list by taking them all on three-hour long kayak trail down the longest river we could find in the state of Florida. While there was a true winner in the comfort department for both rigid (Vibe Kayaks Yellowfin 130T) and inflatable (Advanced Elements AdvancedFrame), all five options had great stability with minimal discomfort. Our only qualms were the minimal pain points at hour three with the inflatable Intex Explorer K2 seat backs, and minor instability with the Sevylor Coleman Colorado when not paddling. Have you always been looking forward to that leisurely paddle across that calm, flat lake water? Perhaps you’ve watched those high-adrenaline extreme sports of cruising it out on down the rapid currents of a river. Maybe, you’ve always loved the outdoors and fishing on a kayak is something you’ve been looking forward to for a while now. You might also be an eternal health and fitness buff, and kayaking just fits the bill quite too nicely. Whatever your reasons for this water activity may be, you are certainly not alone. For thousands of years now, the northern hemisphere’s Eskimos (now called Inuits) came up with this contraption made up of whale skeleton and seal skin waterproofed by oil. Famous for its ability to silently glide through waters, the two-bladed paddle boat had been used for transport, fishing, and even for military purposes since then. Now, you may have also thought that having a mere kayak is not just enough for you. Stereotyping aside, some people may even consider you too social to head out alone. Or perhaps, you’ve been planning on spending more bonding time with a friend or a loved one. Again, whatever the rationale behind your plans is, worry not. Just keep on reading to learn what are the most important criteria and questions you might have when buying your first tandem kayak. What is a tandem kayak? What is the difference between a tandem kayak and a single kayak? A kayak is a small boat usually mistaken for or often times called a “canoe”. Well, for the British, a “kayak” is a type of canoe. Some use kayak-like boats, but they call them canoes. More modern sources show that both types are normally used for the same purposes. However, they basically differ from the positioning of the paddler and the number of blades of the paddle used. Paddlers can kneel or sit front-facing in a canoe while they always do the latter in kayaks. Paddles in canoes only have one blade while kayaks have two blades. Unlike the tandem bicycle, it has been a bit difficult searching the internet for the official definition for “tandem kayak”. However, the word “tandem” is defined as “a group of two or more arranged one behind the other or used or acting in conjunction”. True enough and as its name suggests, the main difference that a tandem kayak has from a single kayak is its number of paddlers. Whereas a single kayak has one space for only one paddler, the tandem has space for two or more paddlers. What are the advantages of a tandem kayak? Family is the key. One of the topmost reasons why buyers choose a tandem is because they’ve got a kid to take along with them on that water adventure. Who wouldn’t want to make sure their kid is safe while having fun? If your kid’s safety is a priority for you, then you’d surely want to make sure that no small kid gets to paddle on their own. A tandem will allow you to stay at the back of the boat while your kid stays in the front spot where it’s easy for you to see and assist if need be. Plus, if you’re planning to bring in more gear for your family’s getaway, a tandem will surely have more space for what you need. It takes two to tango. Well, we know that this age-old adage was coined with a figurative and not a literal meaning. However, it’s no reason to say that said cliché isn’t relevant either. Just like any other undertaking, some are comfortable doing it alone but others prefer companionship. Both options are advantageous depending on one’s circumstances and goals, but let’s focus first on the points for the tandem kayak’s side. There are those who could benefit from having someone to chat to amidst the sight-seeing. Some just couldn’t leave their beloved pet behind, too. If speed and cutting down time is quite important, having another pair of muscles could greatly make a difference to achieve that better paddle power. Calm waters are easier to navigate. However, going through trickier sea realms or river rapids would benefit much from the kayak stability that having two paddlers could provide. Tandems are also good for those intimate couple adventures. Having a kayak each is quite nifty, but staying on the same boat is more romantic. A number of sources have pointed out the above considerations. We wouldn’t be surprised if you’d also agree. What are the disadvantages of a tandem kayak? In as much as we could see the advantages of a tandem kayak, it’s always better to have a more holistic picture to come up with a more viable, well-balanced decision. Thus, looking at the tandem’s disadvantages, we have the following: It could mean harder work. As the tandem kayak is definitely bigger, it is heavier and definitely more difficult to stir. Even if you’re not alone, your companion may be doing less paddling than you would. However, just like anything, having the right mindset and the right amount of briefing and preparation before taking on that big decision could make the difference. Disadvantages can be turned into things to resolve, prepare for, and (eventually) hurdle for that greater goal. For scuba divers and fishing enthusiasts, this is said to be the most popular recreational kayak. The seat is above the water level, so paddlers are able to exit and enter the watercraft more easily. To achieve stability, this kayak has a wider configuration, so you are able to store more gear, too. What is a sit-inside tandem kayak? This more traditional-looking kayak type is enclosed and has cockpits where the paddlers could sit. It is said to be best for touring purposes. Paddlers stay dry and are more comfortable because they are sheltered from water splashes, the wind, and other elements. The answer depends on the purpose of the activity. If the kayak is meant for activities where ease of movement is more important, then the sit-on-top design is better. However, if it’s for tourism purposes wherein not getting wet is a must, then the sit-inside configuration should be more appropriate. Some sit-inside kayaks even have skirts to wrap around the paddlers up to the waist, which is a great shield and best for colder areas. Summer-time will need more breathing space, so that’s when the sit-on-top versions come in. What is an inflatable tandem kayak? As we outgrow the traditional and move toward modernity, kayaks have also ceased to look like how they usually should. One such example is the inflatable kayak, which could be easily transformed from an easy-carry backpack into a watercraft. Simply pump in air, and voila! You’ve got a kayak to go. Plus, this kayak type can come in different shapes and sizes and could cater to one or many. Self-bailing kayaks are best for rapids or white water activities. They have holes where water could easily go in and out to avoid boat fill-up. However, they won’t work as well in calmer waters especially if there aren’t any plugs available for the holes. It also has sit-on-top and sit-inside varieties as described above. The open style kayak is the kayak version of a canoe. It has higher walls and lower seats so it’s easy to enter and exit from. What is a rigid tandem kayak? This is a traditional kayak type. Also called a “hardshell kayak”, it includes non-inflatable kayaks made up of “wood, plastic, fiberglass or composite materials”. In terms of weight, the inflatable kayak varieties are lighter. In terms of convenience, inflatables could be collapsed into backpack size and are, thus, easily stored, stacked, carried, and used. Inflatables are cheaper, too. Thus, it won’t be a surprise if it’s more popular for beginners and new kayakers. In terms of durability, cheaper inflatables are puncture-prone, not as strong, and more likely to sink. Rigid kayaks are therefore better in this regard as they are sturdier and could last longer. As they are lighter, inflatables are not too stable and difficult to maneuver. In terms of maintenance, inflatables require less upkeep. Rotomold is said to be the sturdiest, cheapest, and most widely used material. They are good for those rocky adventures. However, they are the heaviest and are susceptible to UV damage. Fiberglass is made of lighter material and, thus, the swiftest one. However, it is costlier. Kevlar is another synthetic fiber material, which is lighter and sturdier than fiberglass. It is even stronger than steel and heat resistant, too. Thermoform is light, durable, cheap, and UV resistant, so it combines the advantages of the other kayak materials. The plastic may degrade over time but is recyclable. Of course, the final decision would always be dependent on what’s more important to you and what you would be willing to pay for your kayak of choice. The kayak should correspond to what’s required to accommodate the paddlers’ body and gear weight and size. If the kayakers are too light, the watercraft will float too high and will be more difficult to maneuver. If the watercraft is too wide, the kayakers’ elbows may constantly bump the walls and there’s a potential risk of injury. If the kayak is bigger than what’s required, it will move slower than could be. The length of the kayak should also match its purpose. Longer kayaks go straight and faster. Thus, they are more suited for use in calmer waters and longer distances and should require less paddling. Shorter kayaks are more maneuverable and suitable for rapids or white water activities. Aside from length, the rocker is another crucial design element that determines a watercraft’s maneuverability. Sea cruising may not need much rocker. Whitewater kayaking will need to be more “rockered” for easier stirring through rapids and avoiding those rocks and other obstacles. Your kayak’s size should also be able to cater to your planned activity’s storage needs. Recreational day trips will require less storage space. Tourism purposes may require moderate storage. Lengthy sea kayaking expeditions and fishing activities may entail moderate to high storage requirements. Different kayak materials entail different caring procedures. Rotomolded kayaks require less maintenance. However, as heat could make a rotomold flexible, strap the watercraft to the roof to avoid deformation. Fiberglass or Kevlar made kayaks require the least amount of maintenance. Superficial scratches could be easily buffed and polished. Greater structural damages may mean a more specialized composite repair work. Caring for and maintaining your kayak should be done before, during, and after every season. Before every kayaking season, inspect the hull and rigging for any damage. Replace old seats, bulkheads or other parts and accessories as needed. Check and ensure your emergency gear is full and complete. Throughout the kayaking season, carrying kayaks instead of dragging them over the ground will help ensure their longevity, look, and performance. Using handles or carts would be best. Generally, fresh water wash down can easily clean kayaks. Shield kayaks from sunlight or extreme heat. Cover the cockpit to avoid insects, molds, and scum accumulation. After every season, set aside all loose gear then clean and dry your watercraft. Inspect and tend to your kayak’s attached parts and other components. Once you’ve already found the right kayak for your purpose, it’s also equally important to determine the gears available for your kayaking convenience. This should be at the top of your list for very obvious personal safety reasons. Although they are not guaranteed to protect you the way that lifejackets could, they are one of the most common personal flotation devices (PFDs) used by kayakers. 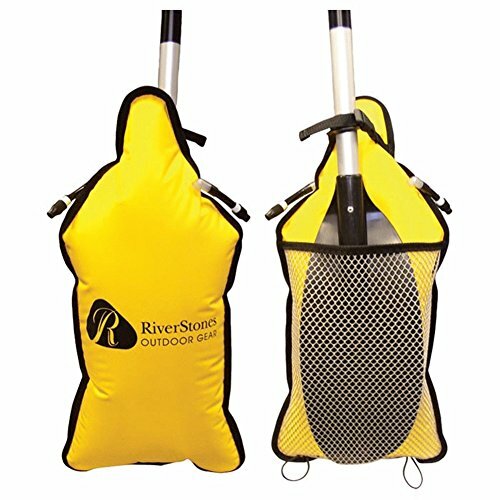 Unlike lifejackets, they’re not inflatable but already come in with a buoyant foam core material; this feature avoids the risk of non-activation or bursting as well as ensure ease of paddling movement. There are three usual types: the over the head vest, the front zip jacket, and the size zip. Unique variations are also available to cater to specific water activities like in slalom, sea and touring, and white water kayaking. When choosing the right buoyancy aid for you, check the following details, too: chest size, weight range, and force provided. They are leg-like projecting structures usually found in fishing vessels meant to increase stability, prevent capsizing, and resist heeling. Paddles are essential when kayaking and are used for pushing against the water to drive the kayak towards the right direction as well as to increase cruising speed. 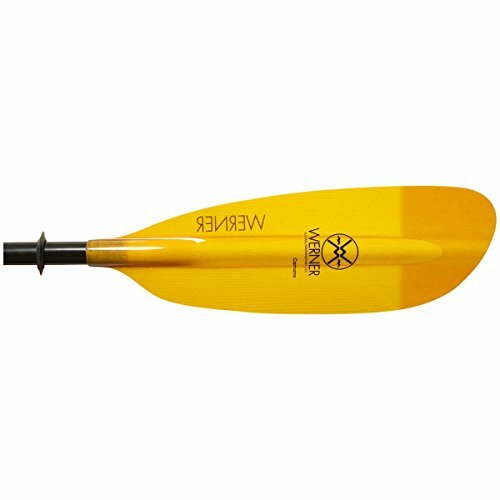 A paddle float is a buoyant material attached to the paddle meant to be an emergency feature for easy paddle retrieval after a capsizing. A paddle float rescue is said to be one of the very first things a kayaker needs to learn. 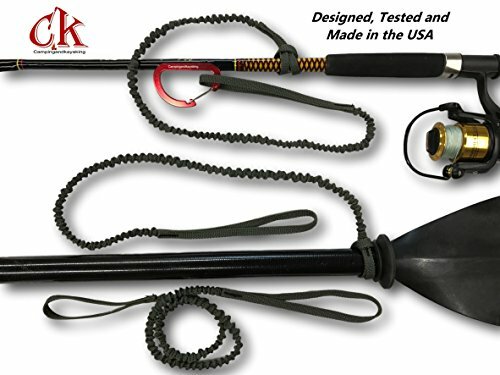 One way to safeguard your paddle from getting lost due to unforeseen circumstances is through a paddle leash. However, it’s not recommended for use during intense watersport activities like whitewater kayaking. 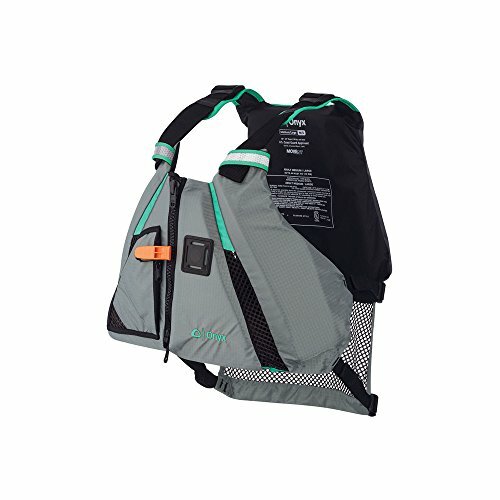 Another safety gear is the sea sock, which is a bag-like waterproofing to fit on lower body and is especially meant for bulkhead-less watercraft. 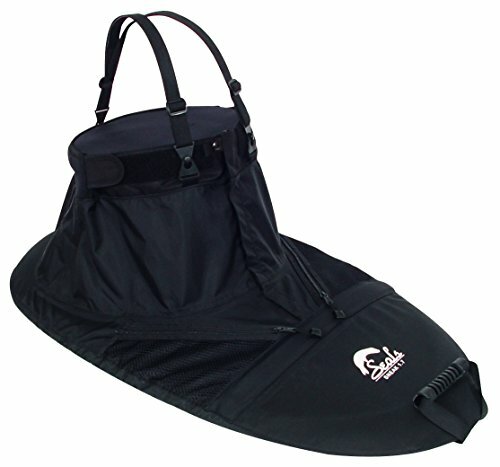 A spraydeck, also called sprayskirt, is another waterproofing contraption but donned by the kayakers before entering the watercraft. Integrating the waterproofing function and convenience of a “paddling jacket and a spray deck” is the tuilik. Unlike the sprayskirt that’s used from the waist down, the tuilik covers top to bottom. 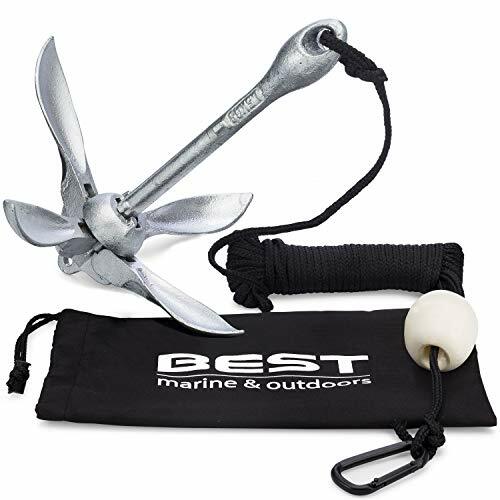 The kayak anchor holds the kayak in place with no drift while fishing. A kayak cart is a must have to transport your long and bulky rigid kayak. With its strong wheels and straps, any big and heavy kayak can be lugged anywhere on multiple terrains securely. When deciding to buy a tandem kayak, it is crucial to ensure you select the right product. Making a bad decision in the kayaking world can result in a subpar experience and leave you jaded to the sport. However, it can be easy to become overwhelmed by the sheer number of options that are available for tandem kayakers. Luckily, we are confident that, with the vast array of available options, one of the kayaks above will meet and exceed any buyer’s needs. All these tandem kayaks should support medium sized dogs but make sure your dog is well trained. So I am currently considering buying the Malibu Two, it looks awesome! But I got a few questions before I buy. Does it need assembling and what is the best way to transport this kayak to my destination? No assembling needed but you need a car rack or a truck to move this kayak around. Hey Agnes, hope you find the right tandem kayaks to suit your needs. I am using Intex Explorer K2 for a year now and I think it is the best entry level kayak you can buy. Go for it!